A new icon will define Dubai's skyline with Emaar Properties unveiling the design and architectural features of a magnificent tower in Dubai Creek Harbour. HH Sheikh Mohammed bin Rashid Al Maktoum, UAE Vice President and Prime Minister and Ruler of Dubai, chose the design by Spanish/Swiss neo-futuristic architect Santiago Calatrava Valls from an international pitch. The Tower serves as the core of Dubai Creek Harbour, a 6 sq km masterplannned development located 10 minutes from the Dubai International Airport. It is centred off Dubai Creek, and in proximity to the Ras Al Khor National Wildlife Sanctuary, protected under the UNESCO Ramsar Convention. Mohamed Alabbar, Chairman of Emaar Properties, said: "The Tower is our tribute to the positivity, energy and optimism that Dubai and the UAE celebrate. It will be the destination for the world to visit, enjoy and celebrate life, as Dubai prepares to host the Expo 2020. With The Tower, we are delivering a compelling monument that will add long-term economic value." Fadel Al Ali, CEO of Dubai Holding, said: "We are proud that our joint venture with Emaar will deliver a new landmark in Dubai. Unveiling The Tower design is an important step. It will offer an unprecedented lifestyle choice, in one of the most sought-after residential and tourist areas of Dubai." Santiago Calatrava Valls said: "My team and I put the best of ourselves into this project, since it is a very special honour to participate. 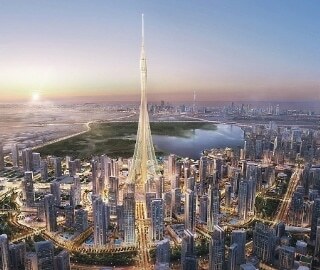 The collaboration with Emaar Properties makes it even more exciting. The design has clear reference to the classic art from the past and culture of the place while serving as a great technological achievement." The Tower draws design inspiration from the lily and evokes the image of a minaret, a common feature and distinctive aspect of Islamic culture. The slender stem serves as the analogy for the structure, which is linked to the ground with cables. Offering unprecedented experiences for 360 degree views of the city and beyond, the crowning glory will be The Pinnacle Room opening to grand views. The VIP Observation Garden Decks recreate the splendour of the 'Hanging Gardens of Babylon.' The piece-de-resistance is the rotating balconies that extend outward. The tower will have a boutique hotel for visitors.